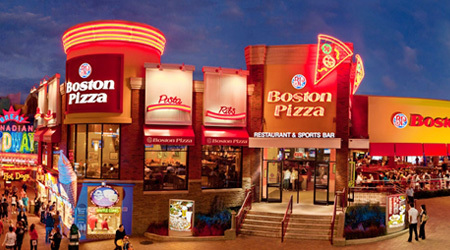 Boston Pizza is located in the heart of Clifton Hill, under the Niagara SkyWheel in Niagara Falls. Boston Pizza offers 24 gourmet varieties of Pizza, made in-house hand pressed dough with 100% Canadian wheat flour. Also you may enjoy more than 100 delicious menu items in Boston Pizza in addition to the Pizza. You have the option to choose a seat with a view of Clifton Hill or the Niagara SkyWheel Courtyard. You can even have a full meal served to you while you bowl or order a drink while you play some games. Boston Pizza offers a set of games and a lot of big screen TVs. It is the perfect place for families, sports teams and groups of all sizes and ages. Also enjoy the dazzling neon lights, the best variety of music from classic rock to today’s top hits, and an all-around fun atmosphere.